Max-Planck scientists have discovered large amounts of ultra-cold cosmic dust in the Virgo Cluster. 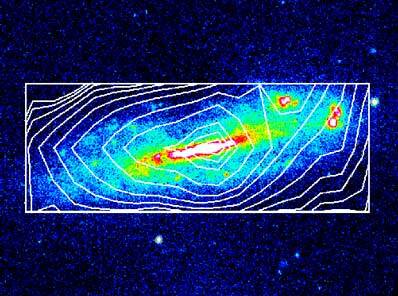 Up to 50 percent of stellar light in galaxies is transformed into infrared light. Just as dust in the earth's atmosphere causes the setting sun to dim and glow red, so dust in galaxies shows its presence by preferentially blocking out the blue components of light emitted from stars. But just how much dust is in galaxies, and how much of the starlight is blocked out? To answer these questions Dr Richard J. Tuffs, Dr. Cristina C. Popescu, Dr. D. Pierini and Prof. Heinrich J. V�lk of the Astrophysics department of the Max-Planck-Institute for Nuclear Physics in Heidelberg, in cooperation with scientists from foreign institutes, have measured the infrared brightness of spiral and dwarf galaxies in the Virgo cluster. They discovered surprisingly large quantities of cold dust, typically ten times that previously known (The Astrophysical Journal, March 2002). Furthermore, estimates of the total amount of light emitted by the stars in the galaxies must now be revised sharply upwards, since the same observations show that up to 50 percent of the visible and ultraviolet light is being transformed into infrared radiation undetectable with human eyes. On top of this, analysis of the infrared emission indicates that some blue compact dwarf galaxies are surrounded by huge conglomerations of cosmic dust, quite possibly tracing intergalactic gas streaming down into the galaxies and giving rise to new generations of stars. The possible effects of dust on the optical appearance of galaxies have preoccupied astronomers ever since Edwin Hubble realised 70 years ago that our Milky Way is just one galaxy amongst many in the universe. Direct observations of dust are needed to understand how much starlight is being released into the universe, what its colour is, and, therefore, what sort of stars were being formed through history in galaxies like our own Milky Way. The team of Max-Planck scientists tackled this issue by measuring the brightness of galaxies in the invisible infrared spectrum of light expected from the dust particles blocking the visible starlight. They pointed ESA's Infrared Space Observatory (ISO) at 63 spiral and dwarf galaxies in the nearby Virgo cluster, carefully chosen to be representative of the overall population of galaxies in the local universe. Making use of ISO's unprecedented sensitivity at very long infrared wavelengths, this work represents the first statistical "census" of the total infrared energy output from "normal" galaxies. Unexpectedly large amounts of infrared emission were discovered from very cold dust particles in almost all the galaxies measured. An example is shown in the picture, where the infrared emission from the spiral galaxy NGC4178 is depicted as contours overlaid on an image of the optical light. Remarkably, the temperature of the cold dust measured in the Virgo galaxies was found to range down to just ten degrees above absolute zero (-263 degrees Centigrade). As a consequence, astronomers are having to revise upwards by a factor of typically 10 the weight of dust in these galaxies compared to previous measurements. The data also show that up to half the total energy output of stars in normal galaxies has been converted from visible optical into infrared photons, much more than previously suspected, necessitating an upwards revision in the total amount of emitted starlight. But the biggest surprise was caused by the so-called Blue Compact Dwarf galaxies in the Virgo cluster. These are so called because when viewed with an optical telescope they are smaller than a tenth of the size of our own galaxy, and dominated by newly born massive blue stars, each shining up to 10,000 times more brightly that the sun. It had previously been supposed that dust exposed to this intense light should be very warm. The ISO observations, however, revealed huge amounts of very cold dust, in fact the coldest found from all the observed galaxies in the Virgo cluster. The scientists propose that this dust is so cold because it surrounds the galaxy, far away from the stars. They believe that "the infrared eyes of ISO may be tracing a dusty mixture of intergalactic gas, which the galaxies are still accumulating, leading to their further evolution."